We not only conduct finite element (FEA) thermal simulations, but also validate them and investigate failed assemblies in the field by thermovision. This kind of analysis provides useful information about temperature differentials reflected from surfaces of analysed materials. In turn it can tell us about any air leakages, thermal bridging, and water content of building envelope assemblies. 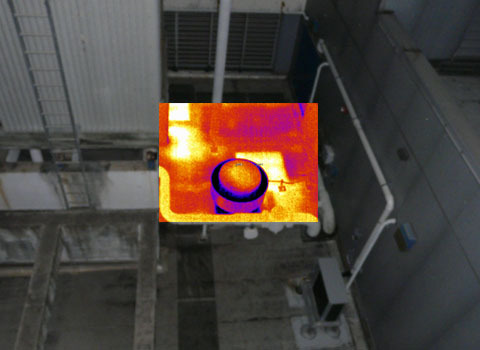 We sometimes couple infrared images with blower doors, in order to identify a hard-to-detect leakage. Most often, you simply ask us whether your roof needs to be replaced, or it can be repaired. The building code typically sets a certain moisture content threshold above which roof is deemed to be to wet to be safely refurbished, and needs to be entirely replaced. In some cases the wet spots may be isolated and easily repairable, allowing to safe the old roof. With the thermal imager, we can often see the wet areas of the roof, taking advantage of the high heat storage capacity of water. After dusk, (this is why we sometimes call it night vision) the wet spots would stay hot for much longer, allowing us to identify them by thermographic images. Thermal image pictures show them as red or yellow, while the colder areas would be represented by violet or blue. We mark them with a paint spray on the roof, and trace them on a roof plan. We also drill core samples at representative spots and analyse their moisture content in our lab. Thermocamera or the thermal imager is the tool which detects long-wave infrared radiation. This is different from the short term infrared radiation, which is commonly refereed as a night vision in reference to security applications. Practice for Location of Wet Insulation in Roofing Systems Using Infrared Imaging.” The heat stored in wet roof insulation can be detected with a thermographic equipment, producing spectacular results. Mr. Scott Wood, the President at Scott Wood Associates, LLC was kind enough to send me an email and then gave me his permission to publish it below. His paper titled “Infrared Thermography for Roof Investigations” is available for free download via the form at the bottom. Your web site is interesting to explore and ponder the wealth of information. I did read your recent addition, “Thermovision”. A rudimentary summary of roof imaging at best, though for some a great intro. If I may, a few comments and an attached paper you may find interesting on the application of thermography for roof investigations I put together. Both morning and evening roof viewing is applicable to thermography, without them both I would have spent many more days on a 800,000 sq ft roof moisture mapping project that required walk on. Night vision is clearly defined as amplified visible light (0.4-0.7um) and should not be related to infrared detection, which observes radiation verse reflection as with visible light. Both midwave (3-5um) and longwave (8-14um) infrared imagers or thermal cameras have been successfully used in building investigations. I have found that many of the midwave cameras provide a better tool for the investigation of roofing due to increased emisssivities at that wavelength for some roofing materials, lowering of the sky’s energy and reflection. Though many find the ASTM the bible for investigative procedures and following them as gospel, I find many useful as guiding tools. Being on the ASTM committee for C1153, I find this one particularly troublesome in that many of the must do’s simply are not followed by most roofing Thermographers. I’m looking forward to an additional update since most of the information is still from before 2000 and sorely outdated in terms of thermography. I have provided Building Science Thermography classes to thousands and would be happy to provide you or your colleagues at your venue of choice. If you should have any questions regarding building applied thermography or interested in organizing a class or workshop please feel free to contact me.